﻿ What can I add to my Cannabis Plants to INCREASE YIELD? Read This! If you’re cultivating cannabis then you’re most probably aiming for increased yields like everyone else. But if you’re struggling to achieve such, read on for tips to get most flowers out of your grow. A plant that is struggling to grow won’t have the strength to support itself. 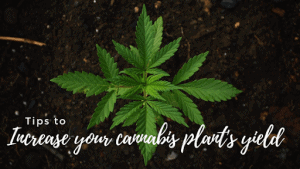 The ideal situation is that your cannabis plant should have a structure bearing their weight as it can help them advance to a more developed stage. One of the best but basic gardening techniques is trellising where you use a wooden structures (but bamboo and some kinds of metal would also do fine) to support and guide your plants. These supports can keep your plants separated and sturdy. In general, a bamboo rod is enough for your cannabis plant to continue flourishing. In general, plants are vulnerable in the vegetative phase, but the good thing is that they are easy to train during this stage. So if you want to guide their development this is the perfect phase to do it. It is important to note that untidy branches and uneven growth can negatively affect the physical development of your plant. So consider subjecting your plant to low-stress training (LST) where you spread out the main stem and side branches using a string. Doing this will make your plant grow outwards in a thick bush. This is actually a no-brainer since if you want to increase your yield, the first thing you need to do is to scale up your production. You don’t need to take more plants than that of what you’re currently cultivating, but you may want to scale up the equipment you’re using to grow them. For example, if you’re currently using a 10-liter container of soil, consider scaling up to a 20-liter container instead and see a bigger yield. Though it may incur extra costs, the yields will be worth it. Your cannabis plants need enough light to boost the photosynthetic process which will directly affect its yield. If you have control over your indoor lighting setup, consider looking for energy-efficient light bulbs that will reduce energy costs and will also lower the risk of heat stress. It is important that you provide your cannabis plant enough nutrition every step of the way if you want better yields. Ensure your cannabis is getting enough water that it needs to grow healthy. They also need nutrients, but be sure not to overfeed them. Your plant needs a balanced nutrition which they can get from quality fertilizers. Fertilizers for LESS have a wide-variety of fertilizers for your cannabis plant. Check it out and shop around for good quality fertilizers at affordable prices!